NASA 'Science WOW!' – Learn more about the latest science STEM opportunities offered by NASA posted "Weekly on Wednesdays." The final Science WOW! newsletter will be posted on April 25, 2018. The Science WOW! newsletter is coming to an end this month. The final Science WOW! newsletter will be posted on April 25, 2018. We will miss sharing weekly updates on NASA science opportunities on Wednesdays, but don’t worry! You can still receive weekly updates featuring NASA internships, webinars, contests and more STEM opportunities. 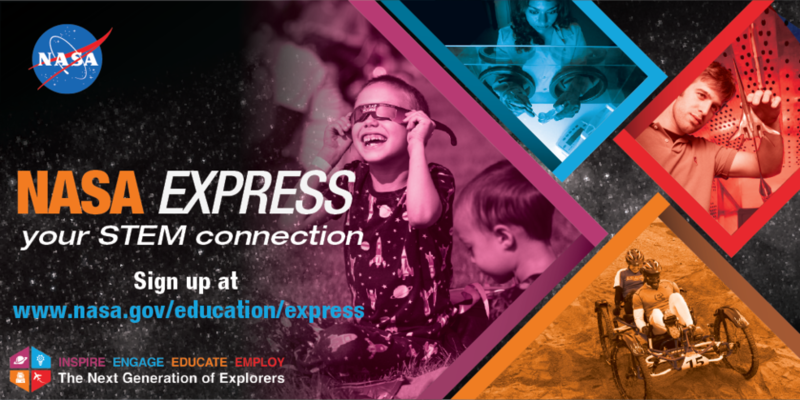 Sign up to receive the NASA EXPRESS newsletter — your STEM Connection. We hope you have enjoyed the Science WOW! newsletter and will sign up to receive the NASA EXPRESS highlighting news about future NASA opportunities for the education community.